Here we come with details about great savings available at U.S. LOFT online. 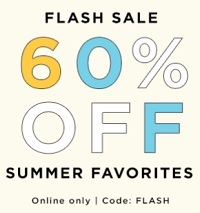 Summer favorites available with 60% discounts. Use the promotion code FLASH to receive the offer. Plus, get an extra 50% discounts on sale styles. Offer is valid for limited time, online only. For more details about the offer visit U.S. LOFT online.